One of Philadelphia’s most iconic parks is getting a new restaurant. City leaders made the announcement Wednesday that a new restaurant will be coming to Love Park. Loveluck by Safran Turney Hospitality will bring dining to Philly's iconic LOVE Park later this year. Mayor Jim Kenney and other city officials unveiled the latest and last phase of renovations to LOVE Park on Wednesday. About 180 people can eat inside and outside the glass-enclosed eatery once it opens. Philadelphia's LOVE Park has already gotten a makeover but the revitalization of the park in the heart of Center City isn't over as a restaurant is added to the menu of options at the iconic park. Mayor Jim Kenney and other city officials unveiled the latest and last phase of renovations — a full-service restaurant in the UFO-looking former Welcome Center in the park — Wednesday morning. "The flying saucer comes back to life," Philadelphia City Council President Darrell Clark said. 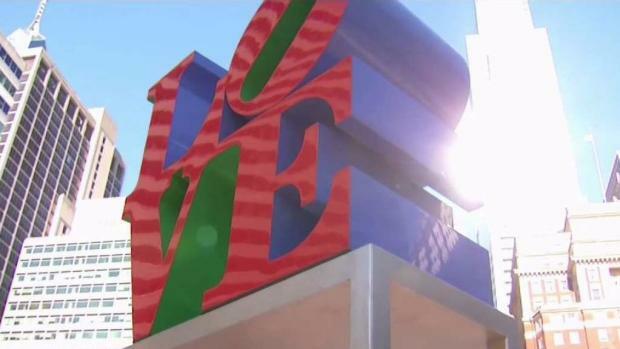 The final piece of the Love Park renovation was unveiled Wednesday. The glass that will surround a brand new resturant, Loveluck. The major facelift includes indoor and outdoor seating. Philadelphia has teamed with Safran Turney Hospitality to renovate the circular Welcome Center at the corner of 16th Street and JFK Boulevard, the City's Department of Parks and Recreation says. On Wednesday, officials gave a first-look at the eatery called Loveluck. Loveluck is being run by Safran Turney Hospitality, the restaurant group of chef Marcie Turney and Valerie Safran along 13th Street that is behind Philly favorites like Barbuzzo, Little Nonna's Verde, Bud & Marilyn's and more. Loveluck will feature 60 seats inside with 360-degree views through donated Saint-Gobain glass, officials said. There will be 40 more seats on the circular balcony and another 80 seats outside, the City said. The restaurant is expected to open later this year. The eatery is being called final piece of a multi-million dollar redesign of the park. As we wait for Loveluck to open, parkgoers can eat grab a bite at food trucks that are expected to ramp up as the weather warms. Back in May, the ribbon was cut on the redesigned park. LOVE Park, officially named John F. Kennedy Plaza, was upgraded over a couple of years. Robert Indiana’s iconic LOVE statue even was moved out of the park for a time. But the statue, with a fresh coat of paint, is back and so is the fountain with colored water. After two years, the city of Philadelphia is marking the grand opening for its renovated LOVE Park Wednesday. Talk about love: the City is also now permitting a handful of weddings in the park as part of the Wedding Wednesdays initiative.